Recently I had to go to the wonderful Department of Motor Vehicles. You’re already excited to read this, right? Yeah, I’m not that excited to write about it either, but since I like to use my blog as a place to confess my foolishness, I figured this would be something I should share. 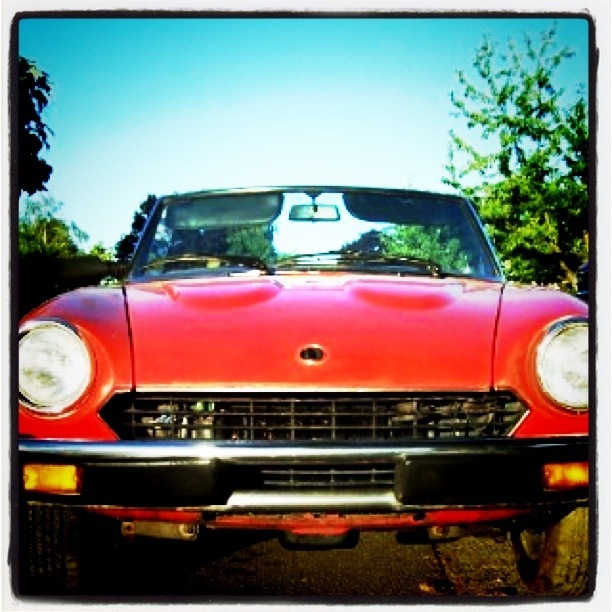 This trip was necessary because it finally became possible for me to register my 1983 Pininfarina Azzurra Spider 2000. (Yes, that’s actually what it’s called. No, you can’t drive it. ). I purchased the little beauty a couple of summers ago while visiting (shh! don’t tell!) California. As soon as I saw it, I knew it needed to come home with me. Even if it wasn’t in drivable condition. And it was missing keys. And had to be delivered to my in-laws on a forklift. But it was a good deal, and I couldn’t leave it… how could anyone resist a smile like that? 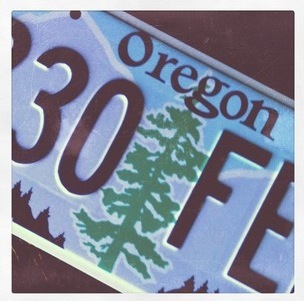 We’d had problems getting plates for it, and registering it because Oregon has incredible issues with California. I have theories on this matter, involving Oregon’s former governor Tom McCall. I think that his statements made in the 1970’s about people coming to Oregon affect us to this day, as he said, “Come visit us again and again. This is a State of excitement. But for heaven’s sake, don’t move here to live.”. Yes, this is about people, but around here I’m beginning to think it’s our state’s current mentality about vehicles as well. Even if they come from states that have way strict emissions rules. Oregon has none, that’s why we have more VW Vans per capita than anywhere else in the world. At least according to the statistics I just made up. So, with current, correct paperwork in hand, my husband and I arrived at the DMV. No line. No joke, there was no line! We carried our forms up to the counter, happy that it seemed everything was finally falling into place. The person working wouldn’t even look at the papers. She told us, since she couldn’t read a date on a paper, she wouldn’t be doing anything for us today. Well, maybe a VIN check. That’s it. She couldn’t read the date. The end. “Take the papers back to where you came from and make them fix it.”, is what she told us. Unfortunately, not only did she deliver bad news, but in the worst of manners. I can’t think of a time where I’ve ever had anyone snap at me like that. Ever. She definitely was not a people person. Honestly, the word that kept coming to mind while dealing with her was “wench”. Here’s the ridiculous part. The date that was unable to be read? The problem in all of the paperwork? They couldn’t decide definitively if one number was an ‘8’ or a ‘0’. It wasn’t handwritten. It wasn’t put on this form by some lazy, half-illiterate buffoon. It was a date, printed by the DMV on an official DMV form. From the DMV. To say I was bothered would be an understatement. I really expected a DMV issued lighting bolt to strike me from the ceiling where I sat. Or security to suddenly arrive. Or a plague of ants to be released from under the bland, grey carpets. But they weren’t, so I continued on…I tried to insist that I wasn’t trying to manipulate the system, and that it wasn’t my fault. I just wanted to be able to drive my car. I pointed out that we’d brought it there, on a rented trailer making an effort to do the right thing. She mostly glared, but I figured since the wench…er, other woman was on the phone, this may be my only chance. I returned to where she was, showed her how I’d neatly filled out all the paperwork and it was ready, and gave her my best, very forced smile. She finally responded with, “Let’s go do the VIN check.” Which meant I had to go outside and let her look at my car. She wouldn’t talk. Not small talk, not even telling me if she could correctly read and match the VIN numbers. She walked back inside, and I followed, admittedly still fearing the wrath of her and the other woman. She started typing things into the computer, pulled out a stamp and pounded it on one of my forms. Then another. “What plates do you want?”, she asked. I was shell-shocked, with no warning she was caving and letting me register the car? I quickly told her whatever was cheapest, I really didn’t care. She walked away, all the while the other woman was glaring in my direction. When she returned, she had new licence plates in hand. For me. For me?! I wanted to pick up those rectangular pieces of metal and hug them. I wanted to feel their lettering, and memorize what they said. I wanted to grab them and run! But I didn’t. I calmly waited until everything was finalized, paid the excessive fees and waited for Todd to get his new picture taken. I probably could have been nicer, even if they weren’t. And I probably shouldn’t have made comments about the women having vision impairments. At least I didn’t comment on the fact that I found her wearing a camouflage jacket to be completely unprofessional. I can’t say the thoughts didn’t cross my mind! After all the fiasco, I can say I’m grateful for extremely undeserved grace. And even more so, I’m grateful I don’t have to return to the DMV until 2014. So, anyone else love the DMV as much as I do? Posted in humor, laughs, life, nonsense, randomBookmark the permalink.